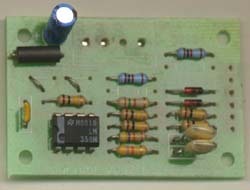 This module contains a pair of two gate to trigger converters, allowing key-down gate signals, or those from gate sequencers etc. to be converted into a much narrower trigger signal as required by some percussive effects. These may come in handy when adapting various drum sound generators to synthesizer use. Connect the inputs to a gate source. Connect the outputs to a module that requires a trigger input. For example, all "pulse" outputs of the gate sequencer could be converted to trigger pulses by putting one gate to trigger converter in line with the incoming clock signal. Alternately, the module can be used as a hard wired adapter when adapting other circuits such as organ rhythm units to synthesizer use. The schematic of the Gate to Trigger Converter. Each of the two gate to trigger converter is functionally identically. It consists of a network designed to convert a positive going square or rectangular wave into a brief positive going pulse. An op-amp wired as a comparator cleans and buffers the resultant pulse. The output can be taken directly from the op-amp, or from the optional transistor buffered outputs, as shown in grey on the schematic (first run of PCBs only). One buffer has been omitted from the diagram for clarity. The component overlay. Connections can be determined from the circuit diagram. The components in red can be omitted, if the links in yellow are included. The option for these components is only available on the first run of this PCB. The optional transistor buffers have been deleted from successive runs of this PCB, so the following only applies if you have boards from the first run: If you decide not to install the optional transistor buffers, a link should be placed from the base (b) to the emitter (e) pads of each transistor position. The 10k pull-down resistors should also be omitted. VER1.1 PCB is electrically identical to the REV1 PCB. The only difference is the addition of anchor holes for the wiring.